triangulation: Oh, the things you find while cleaning! Dead Media is an idea that has long occupied a corner of my brain (and studio) before Bruce Sterling codified the term at the turn of the last century. One look around the forgotten stereoscopes, pre-midi synthesizers, obsolete computer systems and video game consoles from the 70s that clutter my house is a testament to my interest. 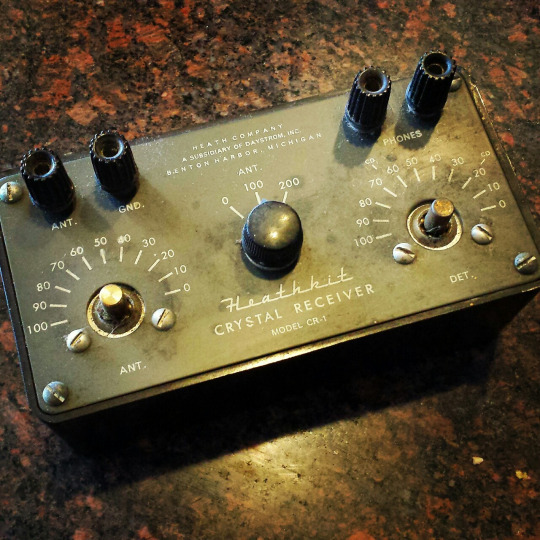 Occasionally my wife feeds that collection by going to auctions and estate sales and bringing home items like this beauty, a late 1950's Heathkit CR-1 Crystal Receiver (along with two separate telegraph keys). Not to get all Doomsday Preppers about it, but the beauty of the crystal radio is they require no power source (handy if the grid goes down). Not that it would survive an EMP (unless shielded in lead), but it's look back at a time when the Civil Defense (CD) station marks were shown on the radio dial (as above on the right at 640 and 1240 AM) and "Duck and Cover" was shown in thousand of schools.